It was a good few years ago that I first saw Leigh Radford's One Skein book - lots of lovely patterns that don't require much yarn! The instant gratification knitter that I am loves the idea that a few hours + a little bit of yarn = finished object. 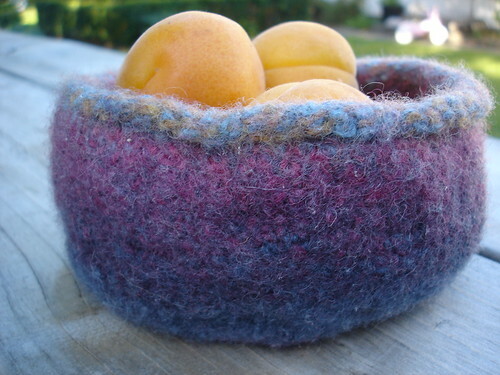 Of all the patterns it was the felted bowls that I just knew I really needed to knit. It's only taken 3 or so years but I finally made one!!! Stash sorting a few weeks ago led me to about 40g of leftover Vintage Hues that I used for my clapotis. I've felted this yarn before with good results so I quickly knitted up the bowl one evening. Then I encountered a problem. 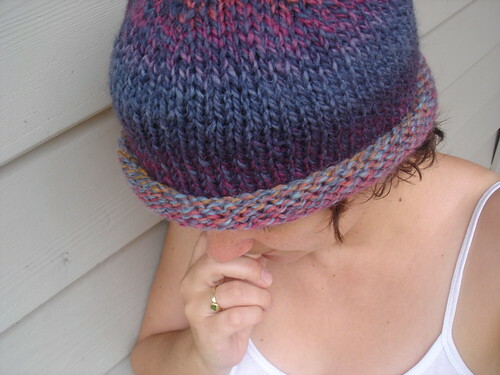 My bowl also made a very cute and soft hat. I suddenly questioned whether I'd felt it after all! Eventually the urge to clean up my knitting basket of all its odds and ends became too much and after several weeks of being undecided about it's final fate, I finally felted the hat-bowl. It took a good few hot washes. I accidentally left it soaking in water overnight and that seems to have been the key to getting it down in size. It's nice and sturdy and the fabric has no stitch definition. It's the perfect size to pop on my bench and hold all the multiple bits of little girl miscellany that seem to breed around the place here. For the photo I used some delicious summer apricots that we've been enjoying lately. It looks great!! I might have a scrap or two of this yarn lying around too...I should use it up in this very manner! And I highly recommend P&P&Z - very amusing! It was the first audiobook I listened to, and it worked very well that way.